My friends Nicole and Brian of The Splendid Spoon (formerly known as Sea Bean Goods) are introducing the Splendid Revival plan. 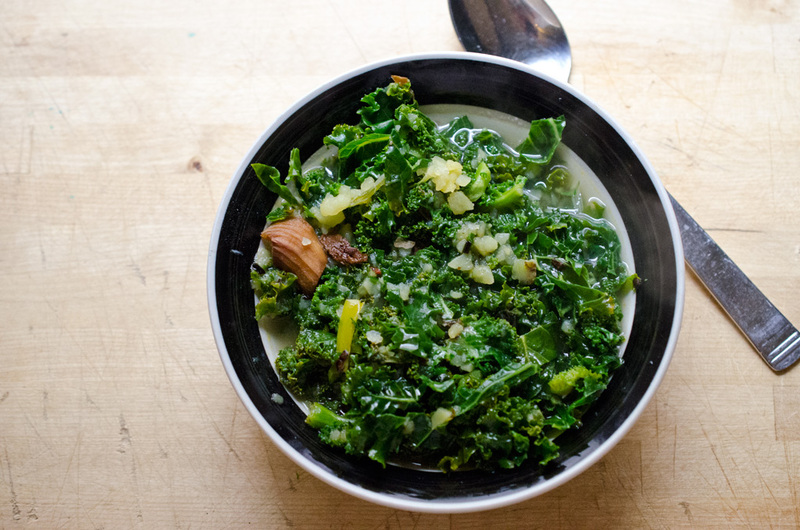 With each plan you get delicious, homemade soups with 2 or more servings of vegetables that are under 300 calories. Us New Yorkers are busy people. Sometimes we just don’t have the time to make something good and healthy and instead just grab whatever are quick (like 99cent pizzas). And I’ve been guilty of that myself and few times my body just couldn’t take it. So do yourself and your health a favor and check out the Splendid Revival plan. Donny: I’m pretty sure by now most of you have heard of the story behind M. Wells and ultimately M. Wells Dinette, so let’s just skip all that and go straight to the food at the new dinette. Howard: I had never been to the original site of M. Wells. It’s true LIC was just a little too far out of the way, but that was only part of the reason. The other is that I had the impression that it wasn’t too vegetarian friendly. They might have gone over the top with bone marrow and foie gras, but I hadn’t heard anything about vegetarian food. But when Donny suggested we check out their new location at PS1 I admit I was curious. So we made the trip for lunch on a rainy day, during the NY Art Book Fair. Lentils are great. You can do crazy, fancy and elaborate things to them or just plain simple like adding them to miso soup. They are great at absorbing flavors and at the same time hold on to their own distinctive flavor. They are cheap, healthy and delicious. Here’s a quick way to eat lentils. Saute diced garlic and onion with lentils in some olive oil. Add enough liquid (water or stock) so that there’s about half an inch between the lentils and the top of the liquid. Bring to a boil and simmer till lentils are done. Add tomato paste, ketchup, salt and pepper to taste. 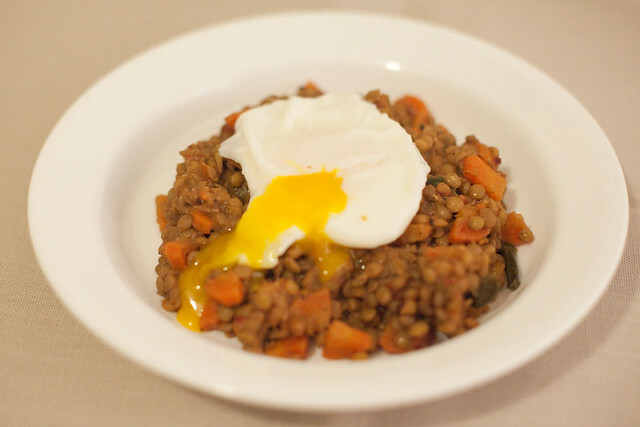 Serve an egg (fried, poached, hard boiled) with the lentils. Here are few more ways you can cook lentils. And then there’s always the reliable lentil soup or if you some have some spices laying around, try making daal. This past Saturday was the return of Smorgasburg or the return of me seeing a bunch of my friends every Saturday. One of those friends is Sea Bean Goods. I met Nicole and Brian of Sea Bean Goods on the very 1st day of Smorgasburg last year…oh my how they have grown those cool kids. If you’re not familiar with them, they make small batches of soups in Greenpoint and they’re freakin delicious. 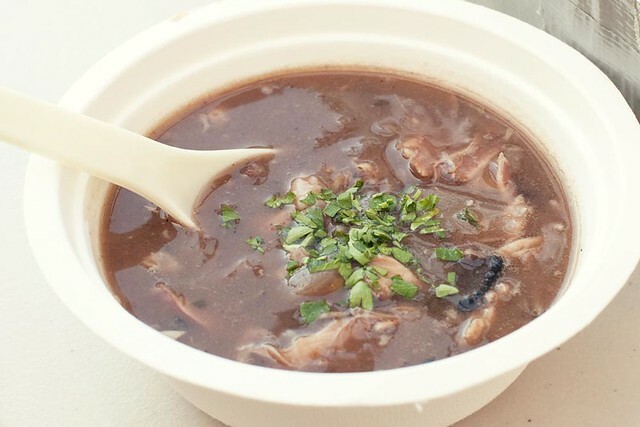 On opening day of Smorgasburg year 2, they had a rabbit stew and a carrot apple soup (perfect for Easter weekend). Obviously I got a cup of the rabbit stew and oh dude it was great! The perfect thing to have on a cool windy day. 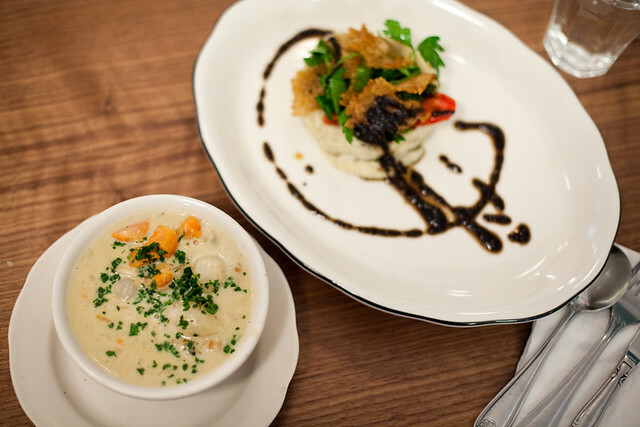 If you want soup but too lazy to go to Smorgasburg or Paulie Gee’s, they deliver also! 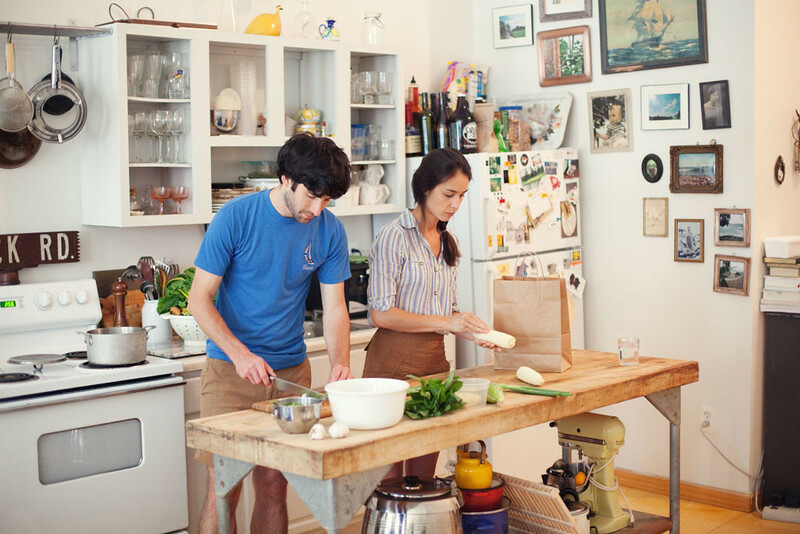 Few months ago they started their soup subscription service where you can get delicious soup delivered to you. Check out my behind the scenes photos of Sea Bean Goods from last year on my photo project, Foodaissance. 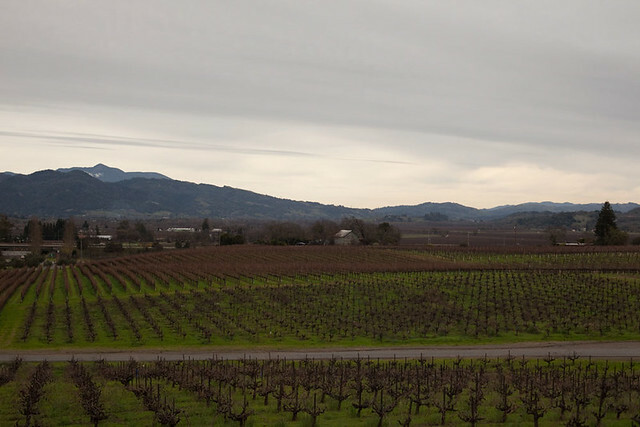 Like I mentioned in my previous post that my friends’ parents had moved to the Sonoma County, 40mins north of SF. That’s where I stayed for the rest of my time in NorCal. The 1st morning Matt had told me about this pretty damn good place for breakfast burrito, a short walk from the house. Being vacation and all we actually didn’t leave the house till during lunch time. 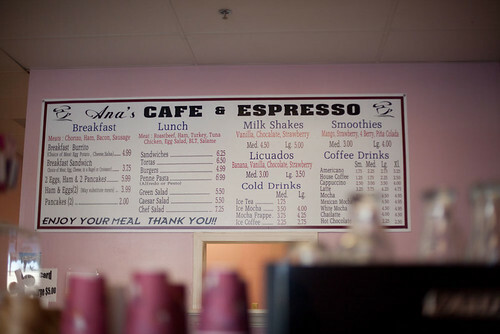 Ana’s Cafe & Espresso was inside a tiny plaza, next to a pet store. When we walked a lady was sitting at 1 of the table reading the newspapers. Wasn’t sure if she was Ana or not. She quickly got up and took our orders. Lucky for us, breakfast burrito seem to be an all day thing. About the size of your forearm and weighs as much as a fat cat, the breakfast burrito came with eggs, cheese and other fillings. I got mine with chorizo and potatoes. I was pretty excited to dig into this monster but being cautious I only ate half of it, planned to eat the rest for a late night snack. 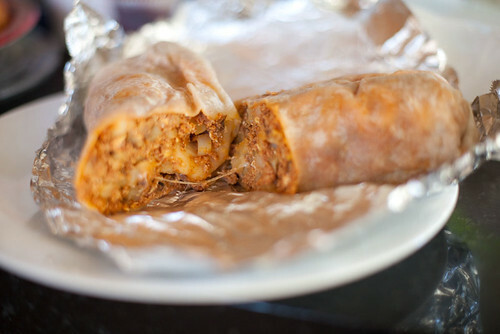 The burrito was okay, didn’t really taste the chorizo and it was mostly potatoes. I work on 7th Avenue in Brooklyn, where there is no shortage of places to grab a bite to eat. The trouble is that so many of them are mediocre, or even bad; there are only a few in the area that are actually really good. Recently three new places opened up, and I’ve tried all three of them on your behalf. 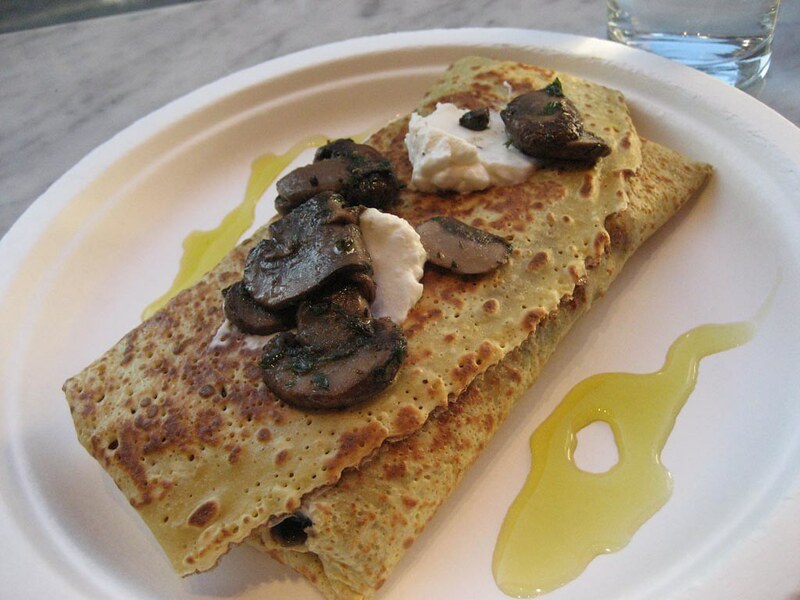 First up is Crespella, an Italian inspired creperie and coffee shop (crespella is the Italian word for a crepe). They had a sign outside advertising a gluten-free crepe, made with chickpea flour. I don’t have a gluten allergy, but it sounded pretty good to me. For $7.50 I got the chickpea crepe stuffed with ricotta, spinach, and mushrooms. They make the crepes to order, pouring the batter on to the round crepe griddle. In my case they flipped the crepe after it browned on one side, and then spread some ricotta onto it. Then a layer of cooked mushrooms, and a handful of fresh spinach, a squirt of oil, and some salt and pepper. Then the whole thing was folded up into a package, and some more ricotta and mushrooms went on top.